Shaun is a great coach – he is knowledgeable and is an excellent communicator. I started SS on my own but realized that bad techniques were limiting what i could do (and potentially might result in injuries). 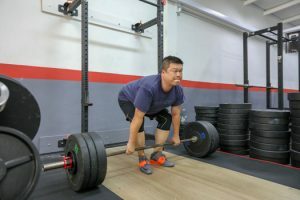 I found Shaun who is the only certified SSC in Singapore online and began to train with him beginning of 2018. Despite all the business travels, he managed to coach me to a PR in press, corrected my deadlift form (my lower back appreciates this), and get my squat and bench right. I was so happy with my progress that I got my cousin who is also doing SS to join me. Subsequently, my dad joined us to train under Shaun as well. The progress for both is fast and visible, especially for my dad who suffered from stroke a few years back. He is now stronger – and especially proud to be lifting weights at 69.